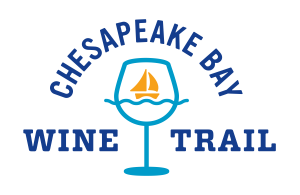 The Chesapeake Bay Wine Trail website design highlights nine premiere wineries located in the beautiful, sunny Northern Neck of Virginia. Refresh designed a customized website that focused on the beauty and history of the area, while ensuring the site was optimized to appeal to their audience and drive traffic to the area. 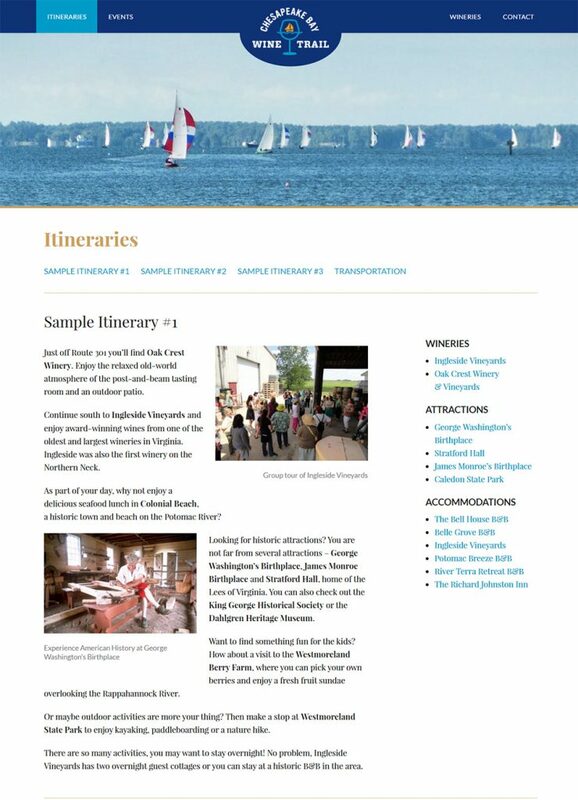 The site now presents wineries in partnership with other activities to build a vision of what a day or weekend trip to the area might look like and engage visitors (vinophiles or otherwise) who might otherwise overlook the region. The trail’s primary challenge was geographic identification. Simply put, local travelers were unaware of the trail’s easy-to-access location. Refresh resolved this issue by displaying the wineries’ proximity to major population centers by featuring an interactive map as a focus point on the homepage. The map encourages click-throughs to information about individual wineries and helps users visually understand that the trail is only a short drive away from home. 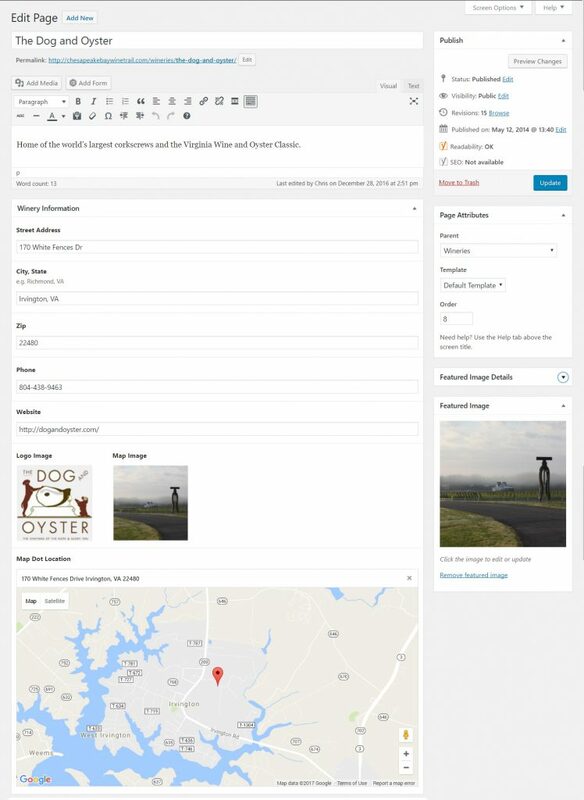 The site features custom itineraries to help users plan their trip to the Eastern Shore and visit all the great wineries the Trail has to offer. 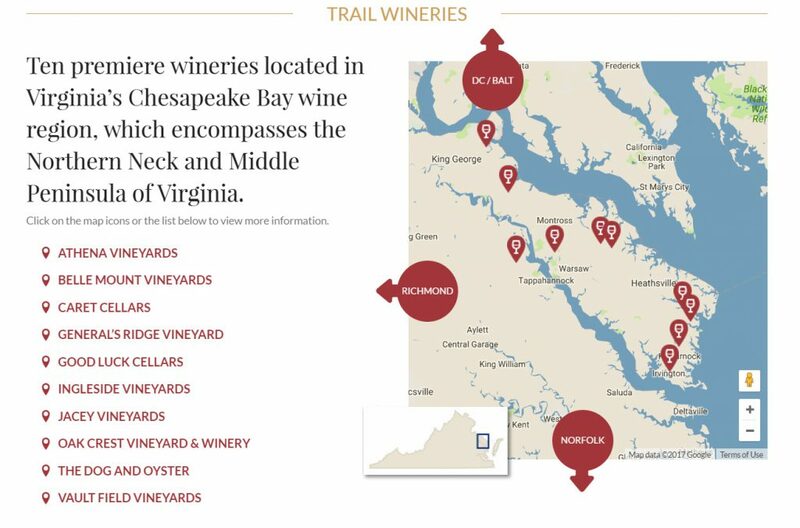 The trail sought out Refresh to help rebrand their organization and market its member wineries to visitors traveling from D.C., Maryland and Virginia. Refresh created a brand guide for the trail, including a versatile logo for use across a variety of media. Finally, Refresh knows that volunteers have limited time to manage a website. The site was built on WordPress and customized to make updates and event promotion as quick and simple as possible for volunteers with no technical background to make changes on the fly from any web browser.